Strawberry Orange Cream Cake - Happy Birthday, The Domestic Front! Today we’re returning to our The Domestic Front Kitchen series with a post on Essential Kitchen Tools. While pots and pans are a little more universal due to either their straightforward functionality or their high space requirements, the tools you keep in your kitchen are idiosyncratic. I have a tendency to pick up kitchen tools right and left — people give them to me as gifts, I receive them in goodie bags at blog events, and I am magically drawn into every Sur La Table or Williams Sonoma I walk past. As a result, this list is not going to be a comprehensive listing of my personal kitchen tools, nor can it be an exhaustive list of every tool you should own. If you really love cherry clafoutis, you should probably indulge in a cherry pitter. If you make cobb salad every Saturday for lunch, an egg slicer might be your bag. This list is just intended to serve as a starter list of some tools I use and brands I love. 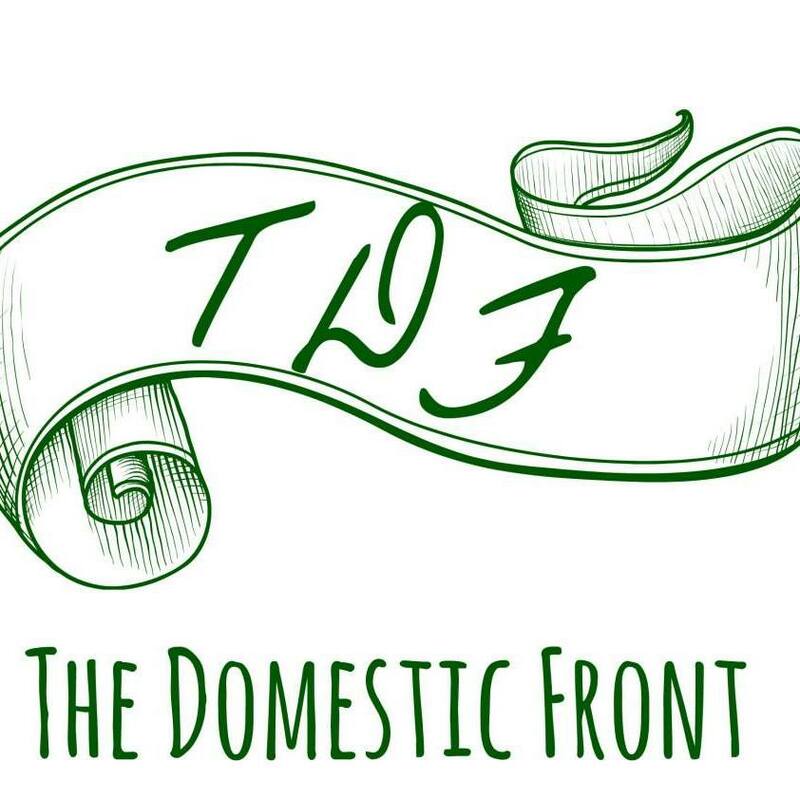 Additionally, read on to the end to find out how to enter the first entry in the The Domestic Front March Madness Giveaway series and win some of my favorite kitchen tools! The first category of tools is what I think of as the cutters — among other things, these live out of reach of the toddler. 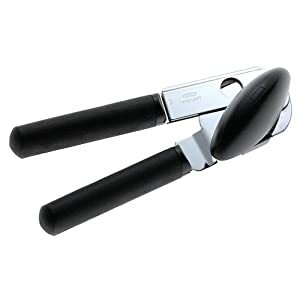 If there is a kitchen tool I am evangelical about, it is the Oxo Good Grips Swivel Peeler . Peeling vegetables and fruits was always a dreaded task with those awful little metal peelers that were in my mother’s kitchen when I was growing up, but now I positively relish it. And it’s not just for peeling — want to make chocolate curls, shave parmesan or add a citrus twist to your cocktail? The Oxo Peeler’s got your back. Although a good quality, heavy chef’s knife like this Wüsthof Classic 8-Inch Cook’s Knife has an important place in any kitchen, for most every day slicing and dicing tasks I reach for my lighter, thinner Santoku knife. The thinner blade makes it seem easier to get super thin slices of onions, potatoes or pears, and the indentations keep the slices from sticking to the knife. 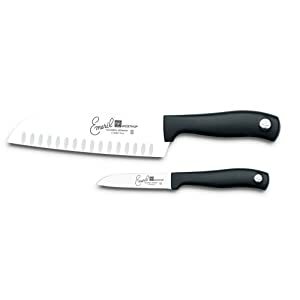 It’s a little cheesy, but I have this Emerilware by Wusthof Santoku Knife and it works for me. 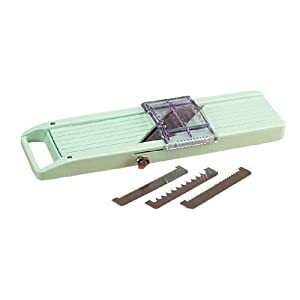 For big slicing jobs, like making a potato gratin or a giant mass of caramelized onions, or if I want really paper thin slices or a big mass of julienned vegetables, I pull out the Benriner Japanese Mandoline Slicer . It’s wicked sharp, easy to use, and inexpensive. One word of warning though – it’s ridiculously easy to get your fingers in the way of the incredibly sharp blades, so ALWAYS use the included finger guard. This PSA is brought to you by the (former) tip of my index finger. For serious slicing jobs I pull out the big guns, but if I want to cut something small, trim the crusts off a sandwich, or um, open a package, I turn to my paring knives. 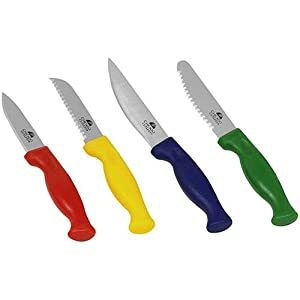 I love this Chicago Cutlery 4-Piece Utility Knife Set because the knives are sharp and the handles are pretty. Hey, it’s not always purely about function. The advent of the Microplane Grater/Zester a few years ago was a kitchen revolution. 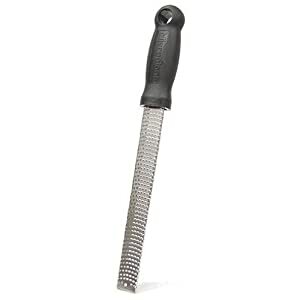 OK, it’s really just a carpenter’s wood rasp, but the sharp blades suddenly made grating hard food items easy. The holes on the standard microplane are really too small for grating, say, cheddar cheese for a quesadilla, but for parmesan, chocolate, garlic, nutmeg or citrus zest, my microplane is awfully handy. The microplane removes any need to by preminced garlic, grated nutmeg or pre-grated parmesan, and therefore singlehandedly improves the dishes coming out of your kitchen. If you’re going to do any serious cooking, you’re going to need to be able to measure your ingredients. 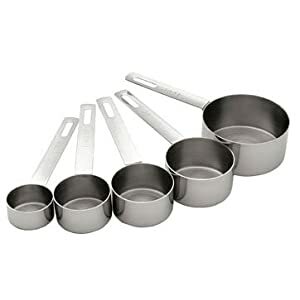 Obviously measuring spoons are essential, but in my opinion you’ll need three different types of measuring cups — one for dry ingredients, one for wet ingredients, and one for something in between. 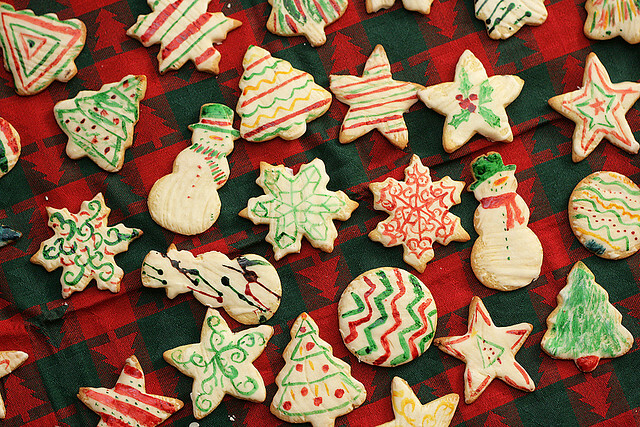 If you’re measuring dry ingredients — flour, oatmeal, sugar, chocolate chips (hmm, I think I should make cookies! 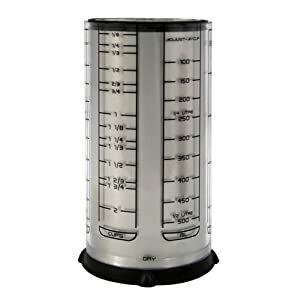 ), you’re going to want a set of cup measuring cups like this 5-Piece Stainless Steel Measuring Cup Set . Most cookbooks contemplate that you measure dry ingredients by the “scoop and level” method, which involves dipping the cup into your bag of flour and leveling off the top, and these are what you need for that. (Brand doesn’t really matter in this case — I usually use my antique copper measuring cups I inherited from my mother, but this set looked functional and reasonably priced). For liquid ingredients, you’ll probably want something more like this Pyrex 2-Cup Measuring Cup . For one thing, the measuring cups above are designed to be filled to the brim, and when I fill them with liquid, I inevitably spill some. 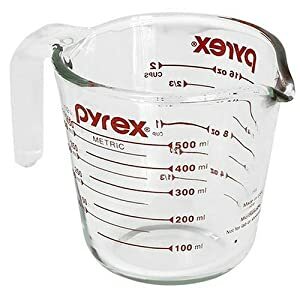 For another thing, this glass measuring cup can serve as a miniature defacto mixing bowl, if you’re mixing, say, butter and milk and eggs for a bread pudding. Finally, the glass can be microwaved, which is great if you need to add warm milk or melted butter to a recipe. Finally, if you find yourself measuring a lot of sticky things, like honey, molasses or peanut butter, I have to recommend this Adjust-A-Cup measuring cup . The center cylinder has little silicone blades that scrape against the outer cylinder, which means these are by far the easiest way to get the last little bit of sticky stuff out of the cup. It can measure both liquid ingredients, like corn syrup (there’s a little bit of give from the top), or dry ingredients, like peanut butter (that you can level off). And the whole thing comes apart for easier cleaning. Tongs are real workhorses in the kitchen. With tongs, you can pull things out of boiling water, toss salads, serve spaghetti, turn things in a pan with more precision and control than a spatula affords, and even pull items off of tall shelves. I grew up with the slippery metal kind, but now I swear by these Oxo Good Grips Locking Tongs . The tips are coated with silicone, which gives them a better grip, and they lock closed for easier storage. Finally, what would a kitchen be without a can opener? You know me well enough to know that cooking my own beans is something I do only occasionally, and sweetened condensed milk is a pantry must. There’s nothing more frustrating than a can opener that doesn’t pierce the can, or that’s hard to turn, so whenever I need a new one (Periodically, ours gets lost), I go and get another Oxo Good Grips Can Opener . What can I say? The products work. I have the Oxo Good Grips. I can’t tell you how often I have tried with all my might to open a jar and it is a no go. Then my husband brought the good grips home from a grab bag at work during the holidays. I felt like I was saved. It works and I am not all tired out just from opening a jar. I have you subscribed via Google Reader. And I subscribe in my Google Reader..
Great post. I also love my Microplane. A must have! I also like my dough scraper, Silpats, and Kitchen Aid mixer! My favourite kitchen tool is my $$$$ set of knives that I bought for my husband. Henckels. Love them! I love, love, love my OXO garlic press. Both the hubs and I are garlic lovers, and the OXO garlic press was a wedding gift. When our first one broke, it was like losing a little piece of our early years together. Off to RT the giveway news right now! We love our Le Creuset spatulas, the little one is always in the sink. The other tools we both love are the 2 Global knives we managed to buy on sale – could not live without! My favorite tool? Probably our santoku knife from Henckels. Thanks for hosting this giveaway! We just acquired a microplane and the Oxo tongs. Don’t know how we lived without either of them. My most used tool are my bendable cutting mats. You are dead on about the microplane grater: I can’t imagine zesting citrus without it. Speaking of citrus, I love my bright yellow lemon juicer that turns halves of lemons inside out. Such a quick way to extract as much juice as possible while straining the seeds. I love my citrus juicer, just stick in half a lemon press and done!! I have a small-ish wire mesh strainer, that I LOVE. I use it every day, for everything from washing rice to draining small amounts of pasta or vegetable. And I’m a rss subscriber! Most of my kitchen tools are half way around the world. I couldn’t live with out the knives that bought in Spain and that came Down Under with us. it’s a toss-up between my shun santoku knife and my microplane grater. They both get a lot of use in my kitchen. THERE ISN’T A SINGLE TOOL I DON’T LOVE!!!!!!! GADGETS ARE MY PLAY TOYS!! I too am a big fan of the OXO products. I also love my ceramic grater, which I use for grating ginger and garlic, and my mini rubber spatula/spoonula set. The mini spatulas are perfect for scraping a small bowl, getting the last of the mustard out of a jar, smoothing icing on a cupcake, or any other smaller kitchen task. My favorite tool is my cutting board. Thanks for the giveaway!! Love my tongs, use them every day. I’m a huge fan of the OXO. I have their peeler (though not the one you mention) and their tongs, which I love!!! And you’re so right, I use my tongs for everything. I was actually at a friend’s the other night for dinner and we had spaghetti. She was having trouble serving it, so I said “where are your tongs?” She looked at me with a blank stare. She didn’t have any. No kitchen should be without tongs. But hey, at least now i know what to get her for her birthday. I was already following you, but I just tweeted about your giveaway. I LOVE my 1/8 cup measuring scoop. It’s the tool that I never knew that I’d always needed until I had one. and I subscribe via my google reader! My favorite tool(s) are my Wusthof knives that I got for Christmas a couple years back. Potentially the most useful gift ever! I absolutely love my Microplane. I’ve only had it for a couple months, and I don’t know how I lived without it, considering my obsessions with garlic, good Parmesan, ginger, limes… I must use my microplane in almost every meal I cook! I’m a fan on fb. I subscribe on google reader…does that count? to be honest my new kitchen aid is my baby, and I love it ever so much. Prior to that it would have to be my rockn choper knife, the little ball thingy for your fingers is great. and once more cause I signed up for the email, I am looking forward to it. My favorite kitchen tool is my food processor! I love my Wusthof knives – I would be lost without them. 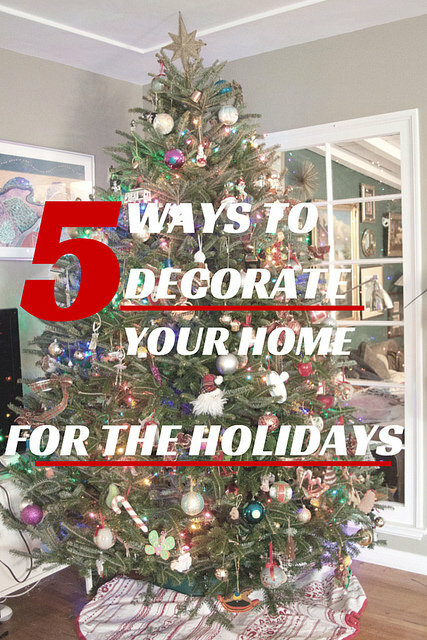 I appreciated the list and links… I am off to amazon to finishing shopping!! As much as I love chopping, slicing, zesting, and grating things, nothing really beats a good, study wooden spoon. I don’t even know what kind I have, but they take a beating like nothing else. for us health nuts, my kitchen scale = heaven. makes for so much easier of measuring ingredients. just put the bowl u need to add the ingredient into and pour in desired amount. no need to dirty up some other utensils. The tool I use the most is my large santoku knife. Nothing too fancy, but it used washed at least once a day. I love good pepper/salt/spice mills. I have one for sea salt, black pepper, white pepper, pink pepper, cinnamon, garlic pepper, etc… I have OXO and Typhoon brand mills. hmm – this is tough. i think it would be the colorful silcone spatulas from williams sonoma. My favorite ktichen tool right now is my mandolin. It’s magical. I love my cast iron skillet. It has charecter!!! I love my Microplane Grater, My Sunbeam mixer is over 30 years old but I love it. Maybe it’s time I upgraded though. My Oxo tongs. I’d love to have an extra one! Oh yes please, i love kitchen gadgets! My favorite kitchen tool is the pestle I carved out of soapstone last night because Gabe needed his meds crushed to a powder, and the soapstone mortar I carved 6 years ago still didn’t have a pestle. My new mortar/pestle combo is smokin’! Also I subscribe through Google Reader!! And even though I read faithfully sans any kind of feedy subscriptiony biznay, I just signed up through Yahoo. But I aint Facebookin’ or Twittering, even for kitchen gadgets. my favorite and most used tool is the classic Chef’s Knife that tapers. it is worse for ware and i can’t get the same one any more but it is the best i’ve ever had. i use it to cut everything. i use my paring knife more now but i used to peal everything with it like my mother. i’ve also joined on your facebook page! i subbed to the rss through google. don’t ask me how, i don’t get it but i saw it there on my creamcheeselotus id thingie. *crossing fingers* i hope to win! 🙂 thanks, this is so fun! Cool giveaway! My favorite kitchen tool is an immersion blender. It’s so handy! 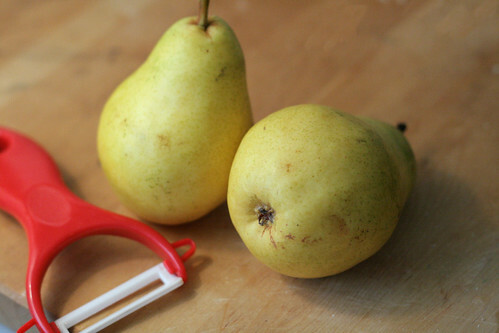 My favorite tool is quite possibly my William Sonoma Garlin Peeler, just that little cylider of silicone that seems to remove the peels as if by magic without getting garlic smell under your fingernails, and rolling it around is just plain fun. I’ll also say that I have a pyrex minixing cup with this little diagonal indentation along the side, that let’s you read the measurements directly from above! So you can guarantee that the base is level and don’t have to slosh it around while trying to pour into it. Plus, I have this really sentimental wisk. Well, I suppose I’m sentamental. The wisk is a wisk. Haven’t been in a while. Love everything you’ve done with the place! my favorite kitchen tool is the pastry cutter–how simplistic is that!! It’s definitely a tie for me between my microplane and my silicone coated whisk! What a great giveaway, thanks!! now a facebook fan too! I love my microplane zester. It’s awesome! : ) I love your blog! There are two gadgets/items I can’t live without. The first is my OXO bowls that have the non-slip coating on the bottom … it is perfect for my clumsy family. The second are my wooden spoons. I probably have a half dozen, and wish I had about a dozen more. They are definately the work horse in the kitchen. I can’t think of a meal I have prepped without them in the past 5 years. Thanks for the chance! The microplane looks wonderful! Oh. And I have subscribed to the feed. Like you I love my Benriner and use it constantly. I also use my stainless bench scraper all the time. It’s perfect for scooping up ingredients from the chopping board to the pot and for scraping a work surface clean of flour after rolling out pastry. I couldn’t be without my flexible chopping mats, light & easy to clean – also handy to funnel large amounts of chopped onions, carrots or celery to the pot. Pick me, please, gadgets are such a weakness. I have to say my favorite kitchen tool is my old box cheese grater.. it’s older than old but I just can’t find a reason to replace it! My Silpat gets a special mention, too. Great giveaway… good luck everyone! I’m a student and just learning how to cook. These tools would be wonderful in my kitchen. and also a facebook fan! And – my food-mill; a very inexpensive one I bought years ago – its prime use is to coarsely mill cans of whole Italian tomatoes for the all-purpose tomato sauce I make in batches to freeze. Easy to use, easy to clean … works like a charm. I love a good old-fashioned potato masher. Nothing helps quickbreads (especially banana bread) come together faster. Microplane, Microplane, Microplane! I need to work for that company!! New web site! My favorite chicken tool is my offset chef’s knife that someone at WS kind of pushed me to buy – he was right! My favorite is the OXO peeler like the one you are blogging about… I even bring it at every cottage I rent because they usually have the cheapest one there or not at all! I susbscribe to your blog with my Google Reader… does it count? anyway, I am a follower. I am a Facebook friend too! 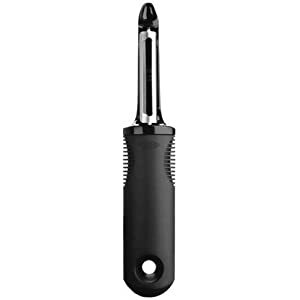 Love the Oxo Good Grips Swivel Peeler. I hate it when peelers slip, or aren’t sharp enough! This one really gets the job done and you can grip it in your hand nicely. Hard to choose my favorite kitchen gadget but…I love my flexible cutting boards. I have to go with a good knife. I’m a subscriber. My favourite kitchen tool is … hmmmm … fancy slicers. My egg slicer and my apple wedge slicer. and … under entry category #1 … my other favourite kitchen tool is my pizza stone, which I use for other things as well as pizza. Hrm. Fave may be my garlic press. But I’m with you on the microplane, how do people cook without one?! My kitchen has 98% OXO in it. The BEST products. 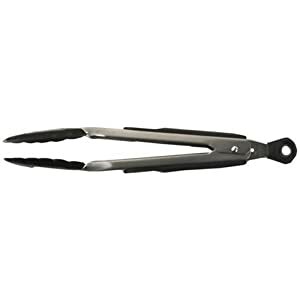 My tool to have if stranded on a desert island are the TONGS! I subscribe via google reader. the first time I’ve done that! I follow your fanpage on facebook. Wow hard to mention just one tool… I would have to say Microplane, I’ve been using it a lot lately! I just subscribed via Email! I have to say my favorite tool is the OXO peeler. It has changed my whole attitude about peeling vegetables. I am an email subscriber and always look forward to your posts. I’ve been subscribed for a while. I think my favorite kitchen gadget may be my ceramic grater that I use for grating ginger. So easy to use and so easy to clean. The microplane is my current favorite as well, mostly because its my most recent purchase and because I made some wonderful gingerbread with fresh ginger because of it. I love my microplane, use it everyday. I am, and have been, a subscriber to your site. Love it. And I follow you with Google Reader! I love the swivel peeler! What a wonderful prize! Thanks for reminding me of a few things I must add to my kitchen supplies!!! I follow you on twitter as well. And…am a follower on Google Reader! I use my smell handheld mesh strainer a lot, usually to strain seeds from lemon juice but also when I make homemade ricotta or lots of other things. I LOVE OXO products too! My fav is their vegetable peeler. Magic worker! Can’t live without my garlic press! A friend recently turned me on to a Zyliss Garlic Press that you don’t even have to PEEL the garlic before using! I’ll have to check those out! I think one of my most used kitchen utensil, other than the ubiquitous wooden spoon is a spatula. I love my mini one from Pampered Chef that I got as a gift. So handy! And I am a subscriber! I’m in love with my roommate’s immersion blender! I use my microplane almost daily. I actually just got another that is coarser. Any Microplane product is amazing! i love to cooke with my wooden spoons but also love silicone “spoonulas” as rachael ray calls them for getting every last bit of anything out of a bowl. oxo is awesome. i recently bought some of their new line of pantry storage containers. One of my favorite tools is a handcarved wooden spoon that I use for everything. LOVE LOVE LOVE it! I’m a fan on Facebook! I’m a follower on Twitter and I tweeted! My fave kitchen tool hands down is the cookie scoop/disher I used to have. When we moved it got broken. Sigh. I love my food processor…first time I’ve had a full sized one. Favourite kitchen tool would probably by the spoonula. Mom & I use that all the time! I became a follower on twitter and tweeted about this contest. I love my good ol’ wooden spoons! Great giveaway! I subscribed too! I am following you on Twitter and tweeted this giveaway contest. I’m @cspod. I’m a subscriber via e-mail. RE kitchen tools, I couldn’t live w/out my wooden spoons of various sizes. My favorite kitchen tool would have to be my big sturdy stainless steel mixing bowl – couldn’t live without it! My favorite kitchen tool is also by OXO – it’s a garlic press, and after having four garlic presses in as many years, this one is my favorite. Since I firmly believe everything is better with garlic, we use it a LOT. I am a subscriber. I <3 google reader. I LOVE my microplane! My husband complains that every time he cleans it, he turns around for half a second, and I have dirtied it again. And I do! I use it for zesting citrus (which is a ton right now that it’s in season! ), grating cheese, garlic, ginger, onion…you name it! I am an RSS feed subscriber! I love my mother’s old wooden cutting board that has lasted all these years. It’s sturdy, it’s dependable, it’s loved. We use our tongs more than any other item in the kitchen – don’t know what we’d do without them! My favorite kitchen tool is my smiley face spoon. It’s not any more effective than a regular spoon, but it’s way more fun to use! I’m a fb fan now! My favorite kitchen tool, hands down, is a garlic press, but a very close runner up would be my french rolling pin. I’ve subscribed for a long time! I need essential kitchen tools, I’m about to move! And finally, I’m just commenting to let you know that I really need these tools! I love to cook but I have no money to expand my kitchen! 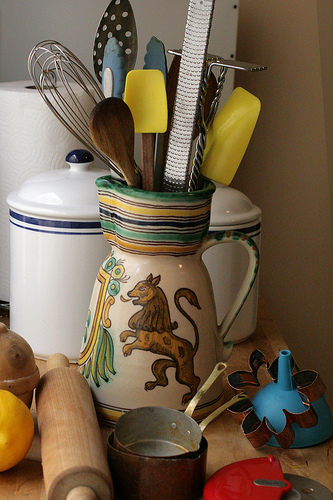 My favorite kitchen tool is probably anything in my knife block! Can’t cook without them.